I just love a mezze type lunch. The table spread with an array of different things to pick and weave through, a bit of this and a bit of that. More often than not I have a bit too much as it is all to easy to sit, chat and graze. Not that that should be an issue, one of the best things in life is sitting around a food laden table with both family and friends. Usefully I find all these little tapas like dishes a great way for the children to try new things. Whilst a whole plate of something new and unfamiliar might raise an eyebrow, a little taster alongside old favourites works well. Regulars to our table include Artichoke Crostini (March 2013), Tomato Bruschetta (July 2013), Focaccia, wild garlic or otherwise (May 2014), Green Beans with Tomato and Feta (June 2014), Herby Ricotta with Pickled Cucumber (September 2014), Roast Cauliflower (February 2015), Cannellini Bean, Parsley and Lemon dip (April 2015), Grissini (May 2015), any of my salads and this Moutabal. I believe I first tasted this with my Grandfather, an amazing and inventive cook. He cooked all manner of things which seemed both unusual and exotic to me when I was young, often containing huge amounts of ginger and garlic. Many middle eastern dishes which involved much pounding with his enormous mortar and pestle which I was lucky enough to inherit. He was familiar with spices now taken for granted but which, at the time, I felt came direct from Ali Barbars’ caves. One such was this Moutabal. 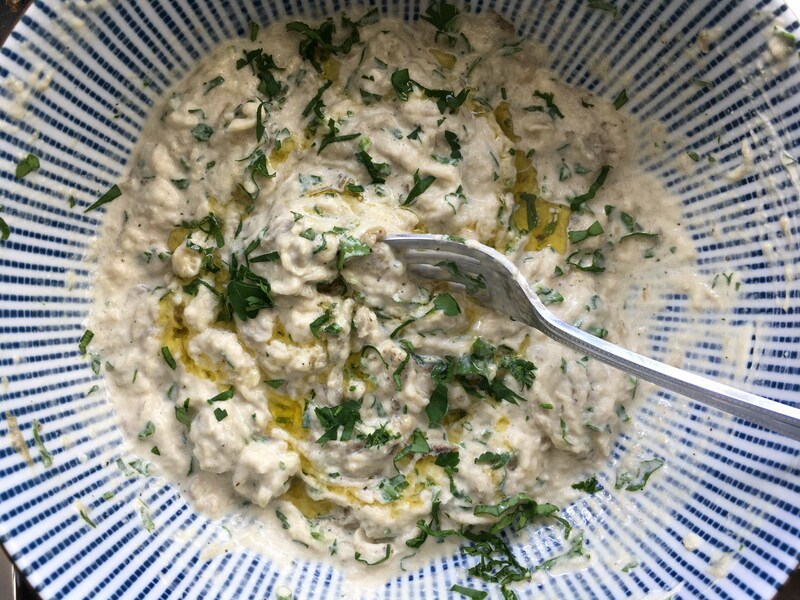 Grandpa loved aubergines and true to form it has a hearty smack of garlic along with softening tahini and yogurt. Delicious though it is no doubt I eyed it with great suspicion, it is not a looker. Anyway, I implore you to see past its drab appearance and give it a go, it is divine on toast but my current chosen route is to serve it with roasted sweet potatoes and a good sprinkling of sunflower seeds, just fabulous. You can put the foil wrapped aubergine in the oven whilst something else is cooking if that suits rather than putting it on for one thing. You can also cook it on a barbecue. Preheat the oven to 200, wrap the aubergine in foil and cook for 40-60 minutes or until very soft. When you can handle it peel and discard the skin and let the flesh fall into a bowl. Add all the other ingredients and mash well, season with salt and pepper to taste. Serves 4 alongside other things or two with some roast sweet potato wedges (which you can do in the oven at the same time).